Tech giant Intel is ratcheting up the March Madness for basketball fans, offering an expanded field of games in virtual reality for the men’s NCAA tournament. Intel’s newly rebranded True VR (the platform and company gained by acquisition that’s formerly known as Voke VR) is partnering with the NCAA and tourney broadcasters CBS Sports and Turner Sports in a three-year deal. “VR technology is the next evolution of bringing the fan closer to the actual in-arena experience. This type of immersive experience will bring in the superfans who truly want to feel the energy and excitement of the game. It also offers a product that brings in a younger demo, given that most VR adopters are gamers,” Hania Poole, general manager of NCAA Digital at Turner Sports told Fox News. The deal gives Intel exclusive live VR game rights for the basketball extravaganza and takes effect with the Sweet 16 round that tips off Thursday night. Intel True VR plans to create six live experiences starting with two Sweet 16 round games in San Jose, the Elite 8 game two days later in that same venue plus the Final Four and Championship in Glendale, Ariz.
That’s an increase from last year when Intel’s VR unit broadcast just three games: the Final Four and Championship tilts, the first time March Madness was live in VR. While the 2016 games were free, fans this year will have to buy a virtual seat courtside. “We believe fans will pay for a robust, unique experience so we are launching what we think is the first sports-related virtual ticket,” David Aufhauser, managing director of strategy and product, Intel Sports Group, told Fox News in an interview. 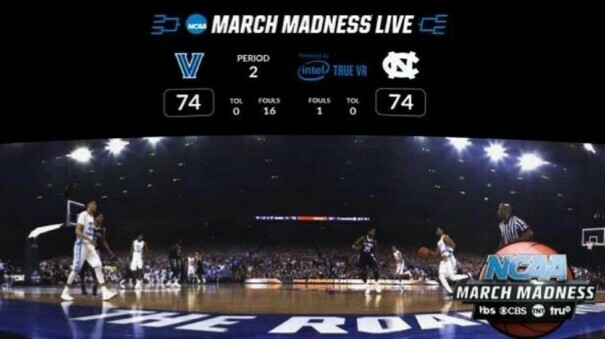 Fans can download the free NCAA March Madness Live VR app in the Oculus store. It will work with Samsung Gear VR. Intel True VR will utilize camera pods consisting of 12 cameras per pod to deliver a total of up to 48 cameras devoted to Sweet 16 and Elite 8 games and 84 cameras covering the Final Four National Semifinals and National Championship. It will no doubt be far cheaper than actually getting into the game in Glendale – the Real VR experiences will set you back $2.99 per game or $7.99 to buy the bundle of all six games that Intel will broadcast in virtual reality. The Gold package seats fans courtside with their favorite team, pumps in audio from inside the arena and offers the viewer choices of multiple camera angles plus dedicated game commentary for the VR experience to help guide viewers in VR. It also allows fans to select a produced point of view, where producers select the shots. “We’re creating an entirely new way for fans to experience content, a different way to tell that story… by allowing fans to have a personalized experience,” Aufhauser said. The Silver package runs $1.99/game and offers fans a single courtside camera view (180-degree live stream) with simulcast commentary from the CBS broadcast crew. Skeptics wonder if fans will keep VR headsets on for an entire game. Aufhauser said, “It’s an evolution. I’d expect it to be a part of a fan’s overall March Madness live experience … the ability to watch on mobile, different devices, and experience in VR now. Additionally, Intel’s 360 replay technology will be utilized during the title tilt. The company will capture game footage of the finale by employing 28 5K ultra-high definition cameras coupled with Intel-based servers capable of processing up to one terabyte of data per 15 to 30-second clip. The special replay was used during the Fox Sports broadcast during Super Bowl LI last month as well as last year’s NBA playoffs.